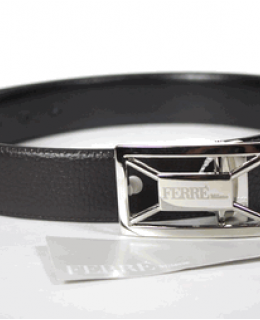 This Ferre Milano designer leather belt is a stylish staple for every closet. Its reversibility makes it perfect for any outfit. One side features dark brown pebbled leather and the reverse is made of black smooth leather. The rectangular buckle puts a spin on a fashion classic with its masculine cut-out design. The silver-tone hardware features an imprinted Ferre Milano logo. Trim leather to fit. Made in Italy.